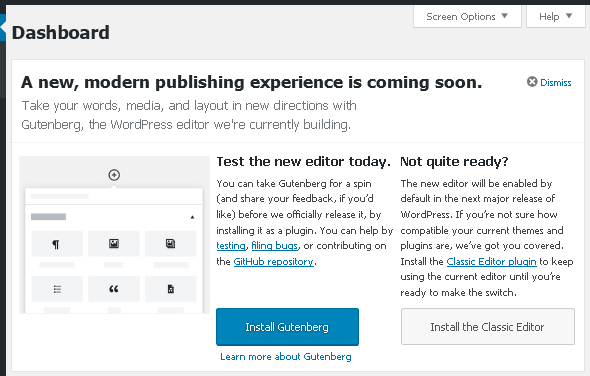 Very soon Gutenberg will become the main content editor in WordPress. This will happen upon the major release of WordPress 5.0, which might be even ready by the end of 2018. Gutenberg is a huge change in the way content has been managed up to now in WordPress. You can have a look at the new editor and get ready for what is about to happen on your website. WordPress 4.9.8 was appealing for users to test the future content editor. For the purpose you need to install the Gutenberg plugin on your website. Afterwards you will be able to switch between the classic or new editor. You can overview the layout and features of Gutenberg without installing it on its website: https://wordpress.org/gutenberg. Gutenberg is a take on a new editor for WordPress that enables you to create and edit rich posts and webpages. It all started as a separate project. Now it is a plugin and soon it is going to be part of the WordPress core as it will replace the classic editor (TinyMCE). Once WordPress 5.0 is released Gutenberg will become the default editor. The new editor uses blocks for all types of data. Title, paragraph, list, image, video, audio, gallery are all processed as separate blocks. Besides these basic elements of a webpage, the editor offers special blocks such as shortcodes or widgets. You can also create additional types of blocks that are not part of the default ones. Blocks are one of the main differences from the current editor where one whole block holds all of the webpage content. The name of the new editor is intriguing. It was named after the person who invented a printing press with movable type more than 500 years ago - Johannes Gutenberg. 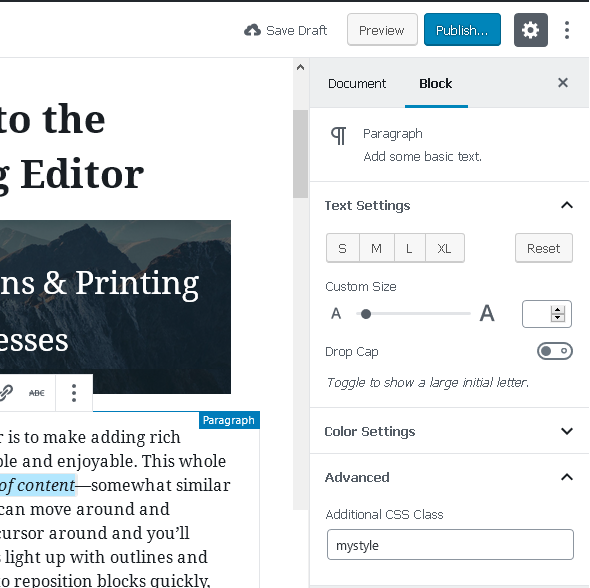 Just like Gutenberg started a revolution in printing and changed publishing forever, the new content editor sets a beginning for a better, user-friendly and contemporary approach to the way content is generated in WordPress. By using Gutenberg WordPress will soon be able to compete with services for creating websites such as Wix, Weebly and others. Page-builders will provide further opportunities for content design. 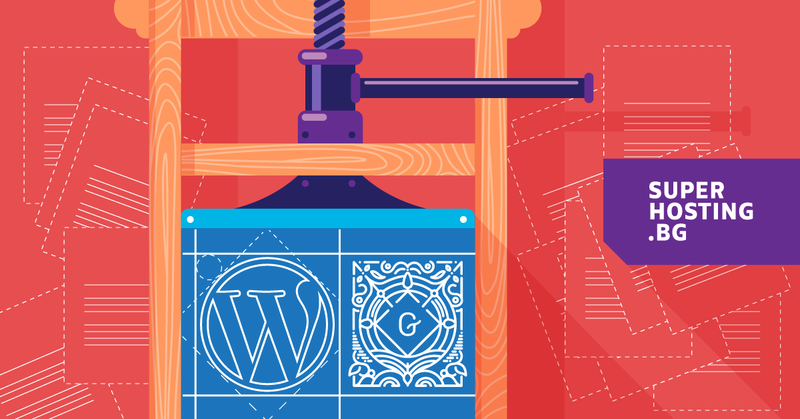 Gutenberg will develop further and reveal its features at a few planned stages in WordPress. The first stage will soon be completed with the release of WordPress 5.0 as it includes generating webpages, posts and introducing the blocks notion. The second and third stage will lead Gutenberg beyond the limits of page content to page templates and to full site customization. When will WordPress v. 5.0 be released? 5.0 is expected to be ready before the end of this year (2018). There is still no schedule announced for the preparation and release of WordPress 5.0. But there is an official confirmation that developers have started working on this version. Optimists are expecting a release candidate of 5.0 in November. Before that we will probably see version 4.9.9 which will add support for the long-awaited PHP version 7.3 (about to be released in December). After version 4.9.9, the release of WordPress 5.0 will depend mainly on the speed of integrating Gutenberg to the system core. With every next week Gutenberg gets closer to being “ready” for its integration in WordPress. Developers of the new editor are working at full speed and almost every week there is a new test version released. At the time we write this article the latest Gutenberg version is 3.9 but we expect to see soon version 4.0. We could only guess if WordPress developers will not reach version 5.0 and match the Gutenberg versions while further developing and enhancing. Each next release contains tens of bugfixes, enhancements and new improvements. This makes every post containing information about incompatibilities or available features in Gutenberg outdated or incomplete only for a few weeks. Many of the flaws or missing features at the beginning have already been fixed or improved. Some of the most interesting improvements and features in Gutenberg up to now are: meta boxes added by plugins below content are now displayed; custom fields can be used through the ACF plugin or custom plugins such as Custom Fields for Gutenberg; you can select layout for each separate block as blocks may be reused and templates can be created for predefined blocks and many more. To choose a default editor after upgrading to WordPress 5.0 you will first need to test Gutenberg. You can do this by installing the Gutenberg plugin on your website. Although installing and activating the Gutenberg plugin is not expected to influence your existing website content, we recommend making it on a staging copy of the website. You can do this by going to cPanel » Softaculous » Staging. Gutenberg: If you wish to use only Gutenberg from now on, do not install the Classic Editor plugin. If you have already installed it, you need to uninstall it. Classic Editor: If you wish for the Classic Editor to stay active after you upgrade to WordPress 5.0, you need to install and activate the Classic Editor plugin. Activate Replace the Gutenberg editor with the Classic editor (Settings » Publish - Classic editor settings). 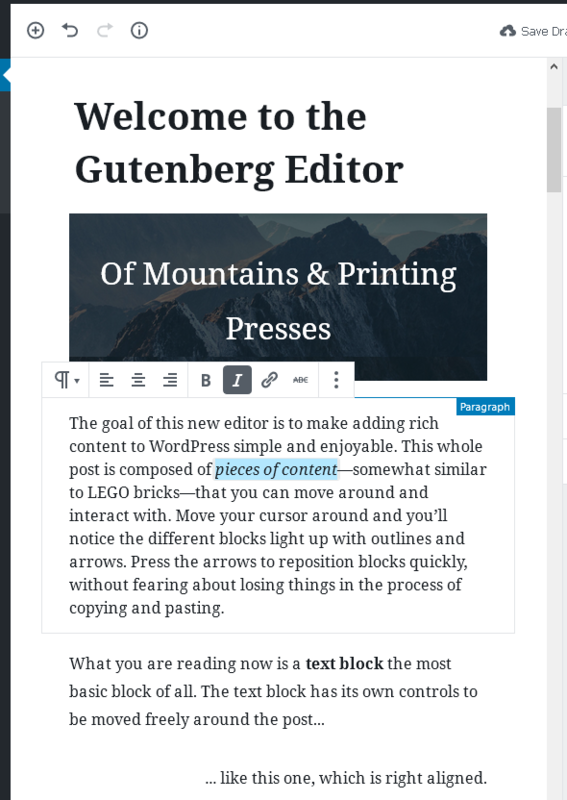 Gutenberg + Classic Editor: In case you wish to keep the Gutenberg editor after testing it for WordPress 5.0, but also to have the option to use the Classic Editor you need to activate the Classic Editor plugin and select the option: Use the Gutenberg editor by default and include optional links back to the Classic editor (Settings » Publish - Classic editor settings). Did you manage to test Gutenberg? If you have already tested Gutenberg, will you use it after WordPress 5.0 is released or you will choose the Classic Editor? If you still have not tested the new editor on your website, install the Gutenberg plugin on a copy of your website. If you tried working with the new editor a while ago, try the latest release which currently is 3.9.0). The latest Gutenberg releases contain many improvements and new features. We will soon provide you with more information about the options to edit the existing content on your website with the new editor.